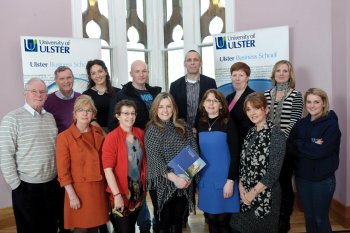 Launched by the Ulster Business School at Magee, the Community Business Academy is a unique initiative that will give groups in the north-west the chance to work with university experts, business mentors and role models. Through a series of workshops, tutorials and one-to-one sessions the community groups will acquire vital business development skills that will help them build on the support that they already provide in their local areas. “Academy members will have free access to workshops and expertise to support their existing community projects, up-skill their team, promote their activities and raise aspirations." Representatives from the Youth Independent Advisory Group, Inner City Trust, Longtower Youth and Community Centre and the PESP attended the launch and first introductory workshop of the Academy at the Mage campus.